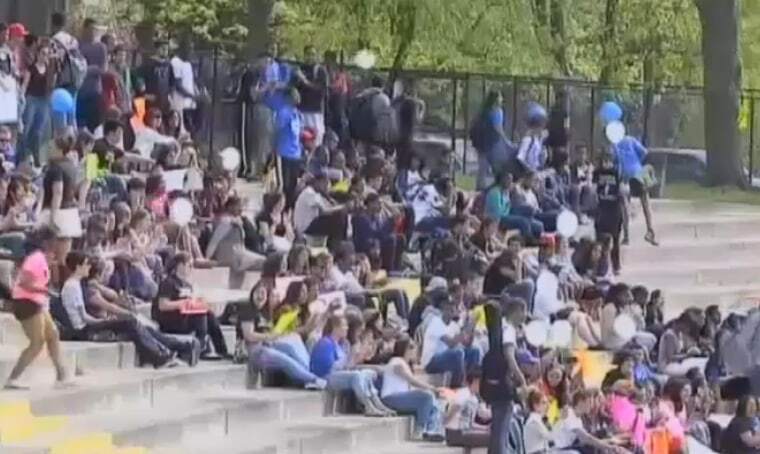 Dozens of students at Teaneck High School held a rally after school Wednesday in support of the 63 students arrested last week in a senior prank, and to protest the charges. Police initially said they found urine in the hallways and extensive damage after arresting the students overnight, but the school superintendent later said there was no evidence to back up the police report. Sixty-three high school seniors were charged with burglary and criminal mischief. A 17-year-old senior at the school, who did not want to give her name because she was afraid of what might happen if her future college found out she'd been arrested, said she never expected police to be called over a harmless prank. "I went, blew up some balloons and then I got arrested by the cops," said the honor student. "A lot of people want to say we're bad kids, and we're really not. We're really not. It was overexaggerated," she said. "We were gonna do the prank, we were gonna go home, say good night to our parents, and we were gonna go to school the next morning and have a good laugh." Superintendent Barbara Pinsak said in a statement last week there was no damage to school property and the cleanup consisted of removing petroleum jelly from doorknobs, sweeping floors of debris and removing graffiti. She said the district doesn't condone the students' behavior but exaggerated reports of mayhem "misrepresent" their school and community. The school did not allow media on the property Wednesday, but students approached reporters, eager to defend themselves in the yearly prank they describe as harmless. "I feel like they were treated like criminals, as if they killed somebody," said senior Hanifa Abbasi. The student who was arrested said she fears her friends' futures are at risk. "By charging my peers, they're destroying futures, they're destroying careers," she said. "I had a talk with one of my peers who wants to go into criminal justice, and he was arrested. How's that gonna look?" Another student who asked to remain anonymous agreed that police "overreacted. It was just a harmless prank."